1. Youngest son of Gideon or Jerubbaal. On the death of Gideon (Judges viii. 33) the children of Israel fell back into the slough of idolatry, from the results of which he had so signally delivered them by the battle against Midian (ib. vii., viii.). Abimelech, the son of one of Gideon's concubines at Shechem, conspired with the Shechemites, for a given sum of money, to have his seventy brothers slain at Ophrah, Gideon's home (ib. ix. 5). All were killed except Jotham, who hid himself.While the assembly of Shechemites was crowning Abimelech at a given place in Shechem, Jotham suddenly appeared on a point of rock on Mount Gerizim and addressed to the men of Shechem a parable (ib. ix. 7-21), the construction and application of which are not entirely plain. The trees of the forest could not persuade either the olive-tree, the fig-tree, or the vine to rule over them. The worthless bramble proposed itself as king, threatening destruction if the trees rejected it. In other words, "this bramble, Abimelech, has proposed his own promotion. If you crown him and trust in him, then rejoice and let him rejoice in you; but if not, let fire come out from Abimelech and devour the men of Shechem, and from the house of Millo and devour Abimelech." Jotham then fled; but within three years his parable or curse was completely fulfilled (ib. ix.). 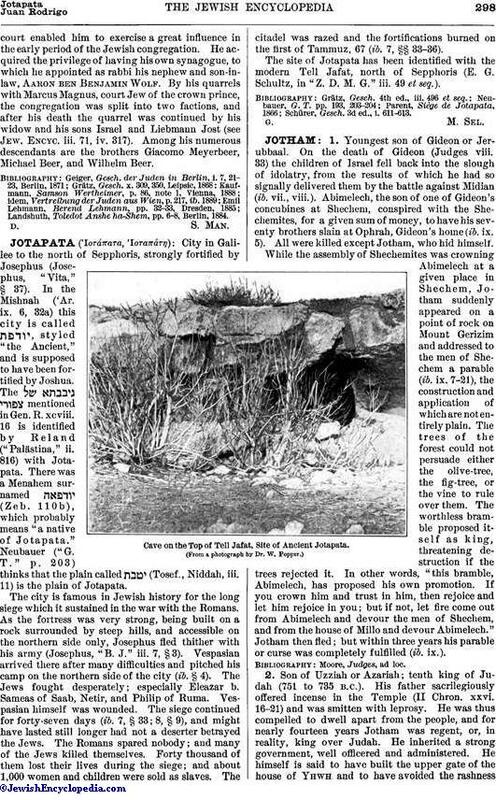 Cave on the Top of Tell Jafat, Site of Ancient Jotapata. 2. Son of Uzziah or Azariah; tenth king of Judah (751 to 735 B.C.). His father sacrilegiously offered incense in the Temple (II Chron. xxvi. 16-21) and was smitten with leprosy. He was thus compelled to dwell apart from the people, and for nearly fourteen years Jotham was regent, or, in reality, king over Judah. He inherited a strong government, well officered and administered. He himself is said to have built the upper gate of the house of Yhwh and to have avoided the rashnesswhich allowed his father to enter the Temple (II Chron. xxvii. 2). "He built cities in the mountains of Judah, and in the forests he built castles and towers." He also defeated the Ammonites, who paid him an immense annual tribute. His might is attributed by the Chronicler (ib. xxvii. 6) to his having "ordered his ways before Yhwh, his God. "But the increasing corruption of the Northern Kingdom began to permeate Judah, as is seen in the words of Isaiah and Micah. 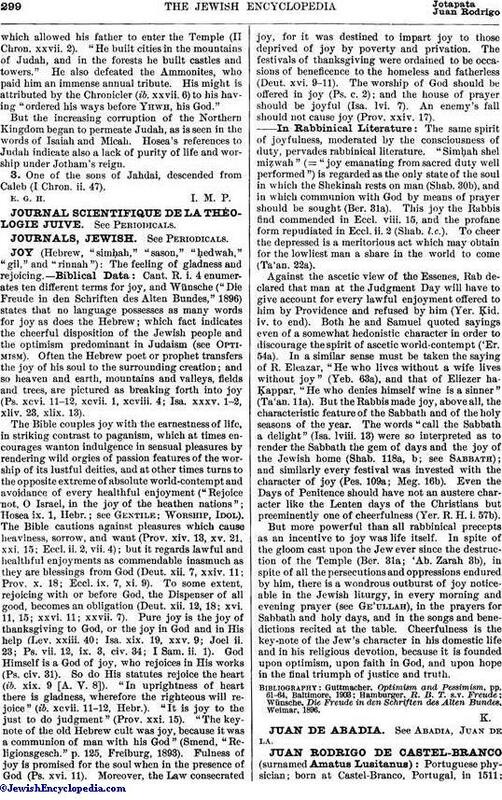 Hosea's references to Judah indicate also a lack of purity of life and worship under Jotham's reign. 3. One of the sons of Jahdai, descended from Caleb (I Chron. ii. 47).